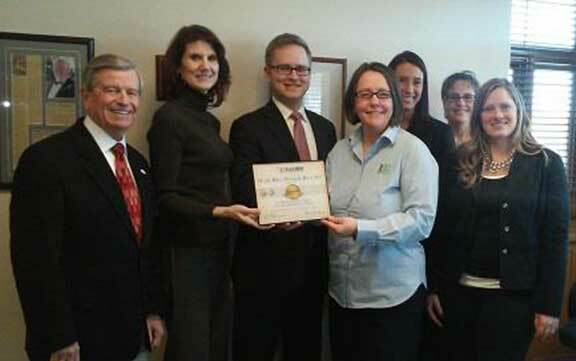 The Wellness Committee at Weld, Riley, Prenn and Ricci has received the Gold Level Wellness Award from the Eau Claire Chamber of Commerce. The Gold Level certificate completion has been a long term goal of the Wellness Committee and is given for Implementing Best Practices in Workplace Wellness. Bob McCoy, EC Chamber President, and Kate Banchy, Health & Wellness Committee Chair, present the Weld, Riley, Prenn & Ricci Wellness Committee with the Gold certificate for Implementing Best Practices in its Workplace Wellness Program. The Weld, Riley, Prenn & Ricci Wellness Program has grown over the last few years from Bronze in 2011, Silver in 2013 and now the Gold! Bob noted that we are the only company to make this progression. Pictured are Bob, Kate, Ben, Cheryl, Amy, Renee, and Jaime (missing from photo are Mindy and Michelle).